Bangkok receives ‘yellow card’ for failing to halt illegal fishing. The European Union said Tuesday that it had warned Thailand, the world’s third largest seafood producer, that it had six months to halt illegal fishing or face a trade ban. “Failure to take strong action against illegal fishing will carry consequences,” European Commissioner for Environment, Maritime Affairs and Fisheries Karmenu Vella said in a statement. The move is part of a broader EU effort since 2010 to crack down on illegal, unreported and unregulated fishing (IIU) by only allowing fisheries products that have been properly certified as legal to enter the EU, which is the world’s biggest fish importer. Cambodia is the only Southeast Asian country so far that has been hit with an outright ban, with the Philippine receiving a ‘yellow card’ last year which was withdrawn by the EU just as Thailand was issued one. “Thailand calls on the EU to take into account the country’s substantial and tangible progress in combating IUU fishing. The EU’s assessment must be transparent, fair, non-discriminatory, and based on accurate facts and latest developments,” the statement said according to The Bangkok Post. At the same time, the Thai government has said that it is rushing to fix the problem in the wake of the EU warning. Agriculture Minister Petipong Pungbun Na Ayudhya reportedly said that the ministry was trying to speed up the enforcement of a recently passed law regulating the fishing industry in order to make improvements quickly. “We are considering either to issue a decree, or to exercise the power under Article 44 to speed up the enforcement of the (new) law because we only have 180 days to work on this,” Petipong told reporters at a news conference according to The Associated Press. At least 15% of world catches, the EU says, are caught illegally every year. Jakarta catches a vessel allegedly involved in slave labor in the fishing sector. 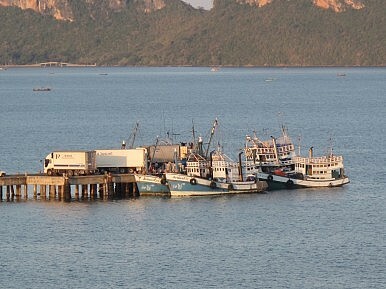 The Thai Sting: A Fishing Raid in the South China SeaIndonesia Wants Global War on Illegal FishingChina and Africa's Illegal Fishing ProblemDid the EU Grant Thailand a Fishing Ban Extension?Can Southeast Asia Tackle its Human Trafficking Problem?